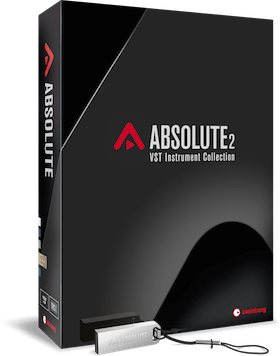 HAMBURG, Germany — September 2, 2015 — Steinberg Media Technologies GmbH today announced the release of Absolute 2, the second version of Steinberg’s VST instrument collection that unfolds infinite possibilities with ten state-of-the-art Virtual Studio Technology (VST) instruments alongside thousands of presets and samples. Absolute 2 includes over 5,500 presets and spans close to 60 GB of first-class sounds. Under the hood lies Steinberg’s latest VST technology, which lays the foundation for some of the finest VST instruments available today. With HALion 5, Absolute 2 includes an extremely powerful sampling and sound creation instrument used by discerning sound designers and producers around the globe. At its sides stand HALion Sonic 2, the Groove Agent 4 virtual drummer, The Grand 3 with many piano emulations and HALion Symphonic Orchestra, the granular synthesizer, Padshop Pro, and the classic virtual analog synthesizer, Retrologue. Dark Planet, Hypnotic Dance, Triebwerk and Zero Gravity are readily available to add even more content to the massive arsenal of sounds. HALion 5 is Steinberg’s latest VST sampler that boasts a multi-timbral audio engine with disk-streaming sample playback, tone-wheel organ simulation plus virtual analog and granular synthesis. Including an exceptional sound library and numerous high-end audio effects the likes of the REVerence convolution reverb, HALion 5 offers an extensive array of creation tools. HALion Sonic 2 is a renowned music production workstation with many synth sounds, hybrid and acoustic instruments that cover virtually every style of music as well as a vast array of sound-shaping options, effects and filters. Groove Agent 4 is the latest drum studio and virtual drumming instrument for producers and songwriters, including a huge library of drum sounds and patterns. Its three Agents specialize in acoustic drums, electronic beats and percussion. The Grand 3 comprises the genuine sound of three concert grand models: the Yamaha C7, the Bösendorfer 290 Imperial and the Steinway D. Also included are the Yamaha CP80 Electric Grand and the upright by Nordiska Pianofabriken, providing a wealth of quality piano sounds. HALion Symphonic Orchestra features an entire symphonic orchestra its samples of which are organized in groups and programs of solo, tutti and ensemble instrument sounds in various playing styles and articulations. Padshop Pro is a state-of-the-art VST granular synthesizer that delivers two individual tiers in granular textures that are mixed and processed with a dozen high-quality filters, modulation and delay effects. Retrologue is a virtual analog VST synthesizer that houses two oscillators, each with a maximum of eight widely detunable voices, one sub and one noise oscillator, alongside a dozen high-quality filter types as well as 300 presets. Dark Planet comes with lead, bass, pad and percussion loops and instruments as well as high-quality sample content, ideal for cinematic scores and musical excursions. Hypnotic Dance offers unique synthesizer sounds with step modulator presets for heavy bass lines and atmospheric pads dedicated to classic trance and rave productions. Triebwerk features seven drum kits, additional percussion kits, hundreds of synthesizer sounds, HALion FlexPhrases and many beats and loops for four-to-the-floor club music. Zero Gravity provides 250 presets and a SoftGrain Wave ROM with 150 samples that expand the library of Padshop Pro. Visit www.steinberg.net/absolute for details on Absolute. The Absolute 2 retail version is available from resellers and through the Steinberg Online Shop for a suggested retail price of 499 euros, including German VAT. Its boxed version contains a USB 3.0 flash drive that holds the entire software. The update from Absolute version 1 is available as download through the Steinberg Online Shop for a suggested retail price of 199 euros, including German VAT. • HALion 5 is a powerfully inspirational virtual sampling and sound design instrument that forms the heart of modern sound creation and production environments. • HALion Sonic 2 features the latest sampling and synthesis technologies, a world-class library and an intelligent user interface that excels in the studio as well as on stage. • The Grand 3 features five premium piano models with an overwhelming sound quality, different microphone positions and much more. • Retrologue offers old-school analog synth sounds and biting sonic blocks, ideal for creating fat and funky lead and bass sounds. • Dark Planet is best-suited for cinematic scores and musical excursions, comprising creepy sounds, shattering loops and eerie instruments. • Zero Gravity is the exceptional expansion pack for Padshop Pro and comes with 250 presets and a fully loaded new SoftGrain Wave ROM.